Jen Peters is a contributor to Dance Magazine, dancer, and mother of two in Brooklyn, New York. For over a decade, husband-and-wife team Pascal Rioult and Joyce Herring, artistic and associate artistic directors of RIOULT Dance NY, dreamed of building a space for their company and fellow artists in the community, and a school for future dancers. This month, their 11,000-square-foot dream opens its doors in the Kaufman Arts District in Astoria, Queens, a New York City neighborhood across the East River from Manhattan. Coming this fall to the ever-expanding Ailey organization is an intriguing new event: the Choreography Unlocked festival. From Oct. 12–14 and 26–28, the Joan Weill Center for Dance will host workshops, performances and panel discussions. 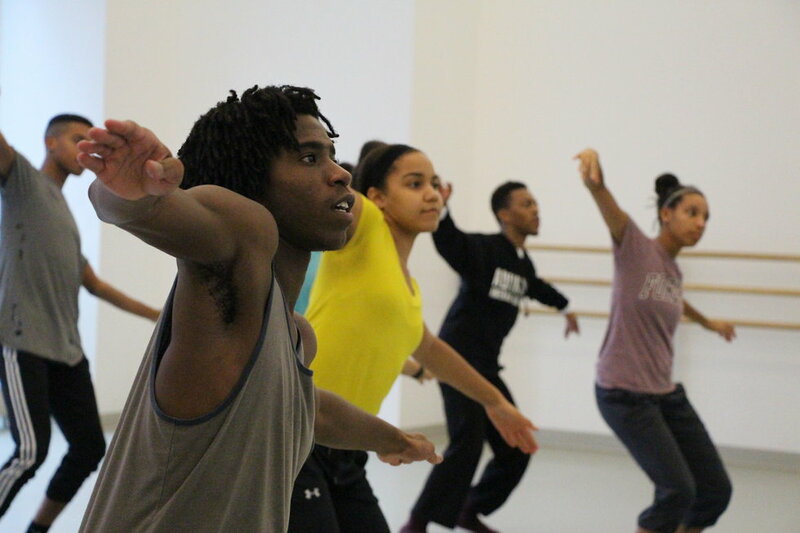 It is an extension of Ailey's New Directions Choreography Lab, an annual residency fellowship for four emerging and mid-career choreographers, founded by artistic director Robert Battle in 2011. The festival offers a rare experience for choreographers to work collectively on their craft, and for students and public audiences to interact firsthand with the process of creating dance. "Choreographers tend to section off on their own, so I wanted to offer classes for them to come together and vibe off each other," says Battle. He also hopes to demystify the choreographic process for audiences. Choreographer Patricia Birch, better known as Pat, says "I was always attracted to Broadway, even when I was dancing with Martha." After Grease's sensational success, Birch continued choreographing and directing, working nonstop for five decades and counting. She directed and choreographed numerous Broadway productions (Candide, A Little Night Music), was resident choreographer for the first six years of Saturday Night Live, choreographed HBO's Boardwalk Empire, and is currently working on touring her musical production, Orphan Train. How Do You Convince A Patron To Give Their Money To Dance? Behind every virtuosic performance, there is a quiet group of champions. Private patrons are critical to the success of American dance companies. Most large troupes only generate about half of their operating budget from ticket sales, while smaller companies recoup only a fraction. In a country with minuscule government funds allocated to the arts, individual contributors play an indelible role in financing concert dance. In What Other Ways Are Patrons Helpful? Board members often have experience in the for-profit sector that can be invaluable to dance companies. Photo via Thinkstock. How Can I Inspire Donors to Fund My Project? Patron Laura Chapman financed and edited former Boston Ballet dancer Laura Young's memoir. Photo courtesy Chapman. "The sun may be shining brightly, but we are not in a very sunny mood today!" said New York State assemblywoman Linda Rosenthal during yesterday's rally for the Artists of Ailey. The dancers and stage crew are demanding increased wages and more comprehensive benefits, what they have termed "reaching for the standard" and "fair wages." Jermaine Terry working on fellow Ailey dancer Sarah Daley-Perdomo's dress while on tour in Frankfurt, Germany. It's widely known how jam-packed an Ailey dancer's schedule is: the company averages between 175 and 200 performances each year. So it's hard to imagine that these artists have time for anything else. Impressively, eight-year AAADT dancer Jermaine Terry has somehow maintained a second career in costume and clothing design. From wedding dresses to one-of-a kind evening gowns for Ailey galas, the self-taught designer is inspired by the challenge. What He Has To Say: Terry gave Dance Magazine the scoop on how, in the words of Project Runway's Tim Gunn, he is able to "make it work." While Barbie is not the first thing that comes to mind as a role model for my 3-year-old daughter (see: unrealistic body image), Mattel has made huge strides to change that. Starting in 2015, they rolled out a "Shero" collection, honoring boundary-breaking women, including 2016's Misty Copeland Firebird Barbie. To celebrate International Women's Day yesterday, the company announced 14 new Global Role Model Barbie dolls—including one based on San Francisco Ballet's Yuan Yuan Tan. Is Contemporary Class Bad for Dancers' Technique? In today's dance world, it seems to go without saying: The more varied the training, the better. But is that always the case? Rhonda Malkin, a New York City–based dance coach who performed with the Radio City Rockettes, thinks trendy contemporary techniques that emphasize improvisation and organic movement quality are detrimental to the precision and strength needed to be a Rockette, in a traditional Broadway show or on a professional dance team. Her view is controversial: "If you really want to work, making $40,000 in three months for the Rockettes or $25,000 in one day filming a commercial, you need ballet, Broadway jazz, tap, hip hop—not contemporary," she says. How Do You Find The Strength To Be Vulnerable Onstage? In a sheer red slip—dirt-covered and exposed—the Chosen One frantically pleads with the community encircling her, wildly dancing until she at last succumbs to an inevitable death. Part of Pina Bausch's haunting Rite of Spring, this solo is one of the most vulnerable in dance. "When I perform this role, there is no acting, my struggle is very real—it becomes very spiritual," says Tanztheater Wuppertal dancer Tsai-Wei Tien. "I squeeze everything I have into those final moments." A truly unguarded performance electrifies the stage and connects deeply with the audience, in a way that surpasses even the most flawless technical prowess. It was a Christmas Eve that The Lion King dancer India Bolds will never forget. Exhausted from a long week of performances, Bolds was clueless when she saw her cast mates randomly dancing in Broadway's Minskoff Theater lobby, and even more confused when they morphed into a choreographed flash mob. But when her boyfriend of four years, Dale Browne, popped up in the mob wearing a beautiful blue suit, she realized what was coming. A newcomer to Batsheva's main company, 23-year-old Amalia Smith is quickly learning how to keep her body safe and supple during Ohad Naharin's rigorous rehearsals and world tours. Fatigue has become both a hurdle and a teacher. "Decadance is pretty much a marathon, and the new piece Venezuela is such crazy cardio I nearly had an asthma attack!" says Smith. Fortunately, the new discoveries she's made through Gaga have helped her handle its intense demands. In 1960, America was in the midst of a social transformation. The Supreme Court had ruled "separate but equal" unconstitutional six years prior, but the country's response was slow and turbulent as desegregation incited violent responses. Surrounded by powerful civil rights momentum, a 29-year-old Alvin Ailey created an ode to the resilience of the human spirit: Revelations. "Alvin was making a statement about African-American cultural experience, saying, 'Hey, this is who we are, we live here, we were born here,' " says Judith Jamison, artistic director emerita of the Alvin Ailey American Dance Theater. "It was a brave action. Civil rights were roaring, and our protest was our performance." Last night was not your average Thursday at Bay Ridge Ballet in Brooklyn, New York. Studio owner and teacher Patty Foster Grado—a former Parsons Dance Company dancer—was teaching a boys class, when with only five minutes left, she heard commotion in the waiting area and someone yelled, "There's a lady giving birth in the bathroom!" After 12 seasons dancing with the Rockettes, Rhonda Kaufman Malkin knows a thing or two about becoming one of Radio City's iconic dancers. Since 2006, Malkin has shared her secrets to success as a dance coach and personal trainer in New York City through her company Fusion Exercise. She's had 36 students book the Rockettes, and numerous others land Broadway shows, national tours, commercials and even Beyoncé's tour. At the most recent Rockettes callback, over half of the 25 dancers had taken class with Malkin—and seven of them were offered contracts. Here's how to get to Radio City, according to Malkin.